1587 - Execution by Elizabeth I. In April 1558 Mary married Dauphin of France, Francis, Henry's son. He ascended to the throne in 1559 as King Francis11. This was the same year Elizabeth I became queen of England; Mary's Tudor blood made her Elizabeth's cousin. This would prove problematic for both. King Francis11 died in December 1560. Widowed, Mary returned to Scotland in 1561. She faced many problems. A Catholic in a Protestant land, many regarded her as a foreign queen with an alien religion. Most difficult of all were the Scottish nobles, who cared more for private feuds than supporting the crown. Yet Mary started well, practising religious tolerance and papering over the cracks in Scottish politics. The slide started with her second marriage to the Earl of Darnley, in 1565. Their relationship quickly soured and the murder in March 1566 of her secretary, David Rizzio, by Darnley and a group of nobles, convinced Mary that Darnley was after her. The birth of their son James in June did nothing to help and, now Mary had an heir to think of. In December 1566, Mary Stuart, Queen of Scots had seen her baby son baptised in the Chapel Royal at Stirling Castle according to Catholic Rites. England, France and Savoy were all represented and sent lavish gifts. Although the Protestant Lords remained outside the Chapel door at the baptism, they did take part in three days of rejoicing, including jousting, feasting, dancing and fireworks in and around the castle. Mary's enemies claimed that she started an affair with the Earl of Bothwell, plotting with him to kill Darnley. She was certainly considering divorce. Yet events took over. In February the house where Darnley was staying blew up; he died of strangulation. Just three months later she married Bothwell, the chief suspect to this murder. He proved no improvement on Darnley and the Scottish nobility rebelled. In June 1567, Bothwell was exiled and Mary deposed. The next year, her supporters were defeated in battle and she fled. From a powerful and respected position, Mary suddenly collapsed. Suspected of involvement in the murder she was eventually forced by the Protestant Lords into prison, where at Loch Leven Castle she was forced to sign the instrument of abdication in favour of her son, the thirteen month old Prince James. This abdication on July 24th, 1567 marked the end of a twenty-five year struggle between the English supported Protestants and the French supported Catholics, and although politics was as significant as religion, the protestant group appeared to have triumphed. The Protestant Lords, with the young Prince in safe keeping in Stirling Castle, needed a speedy coronation in a church which was safe, close to the Castle, and of course, protestant. The answer to their problem was of course the Church of the Holy Rude. In considerable haste, the coronation was duly held in the Church on 29 July 1567. John Knox preached the coronation sermon, presumably with some relish, on the slaying of Queen and the crowning of the young King. Mary sought refuge in England. Elizabeth, loaded with the political cunning Mary lacked, employed various excuses to imprison Mary for the next 18 years. Mary, desperate to be freed, first tried pleas and, later, plots. The discovery in 1586 of a plot to assassinate Elizabeth and bring about a Catholic uprising convinced Elizabeth that, while she lived, Mary would always be too dangerous. Although she was a queen herself, Mary was tried by an English court and condemned to death. 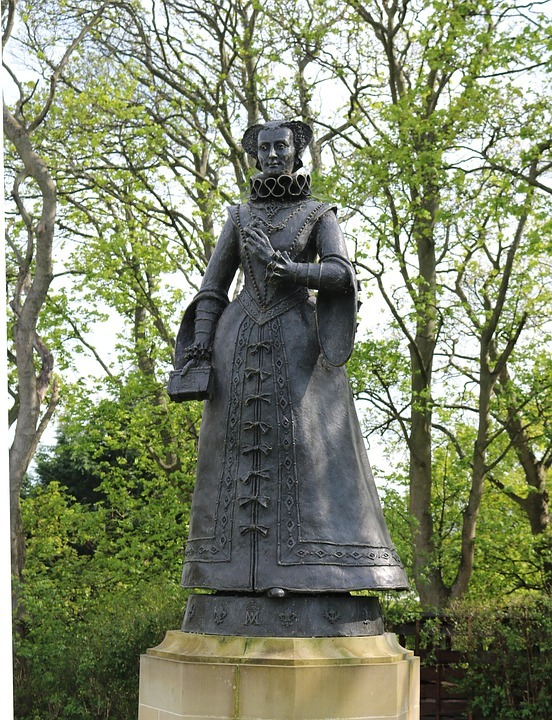 She was executed in 1587, aged 44.